Today was the second day of the Zagreb Grand Prix 2017 in Croatia. After a first day rich in high-level judo, this Saturday was dedicated to the categories of women’s -63kg and -70kg and men’s -73kg and -81kg. The Zagreb Grand Prix had the honour to welcome today the President of the Republic of Croatia, Mrs. Kolinda Grabar-Kitarovic, who was present at the opening ceremony. Elected in 2015 as the first female president of the country, she was pleased to note the seriousness of the organisation and the popularity of judo. Also present in the official stands was famed discus thrower Sandra Perkovi. The two-time Olympic (2012, 2016) and World (2013, 2017) champion and a four-time European champion (2010, 2012, 2014, 2016) is a good friend of Barbara Matic, who was present in the final block of today's competition. Last year the Zagreb Grand Prix was visited by Marin Cilic, the Croatian professional tennis player, who won the US Open in 2014 and all together 17 ATP singles titles. Before the opening official ceremony, Mrs. Kolinda Grabar-Kitarovi could meet all the children who participated in the judo animation led by Ilias Iliadis and Mark Huizinga. 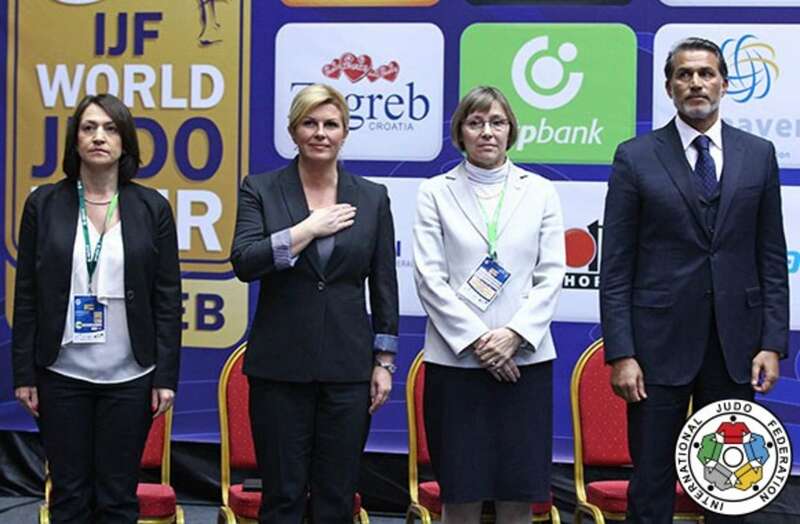 During the opening ceremony, where the deputy mayor of Zagreb, Mrs. Jelena Pavievi-Vukievi was also present, Dr. Sanda Corak said: "On behalf of the Croatian Judo Federation it is my honour to welcome you in Zagreb to the fifth edition of the Grand Prix. There are very good competitors and great matches over the weekend. With this event we can raise the awareness of judo in the country and worldwide. In a few weeks we will organize the Junior World Championships, so I will welcome you soon in Zagreb again." 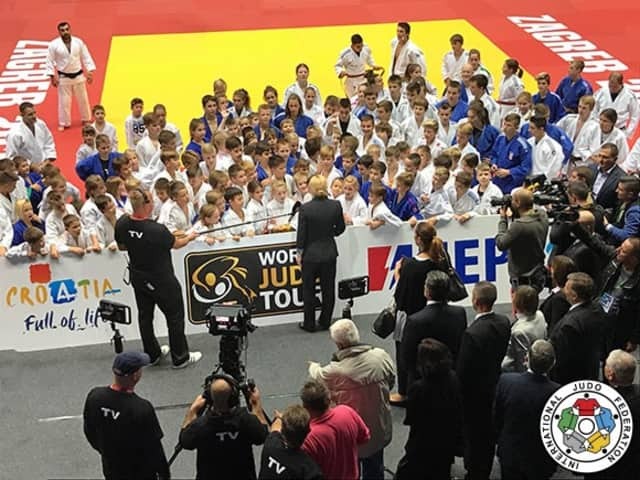 Mr. Naser Al Tamimi, IJF General Treasurer, said: "Dear Mrs. President of the Croatian Republic, dear President of the Croatian Judo Federation, dear friends, on behalf of the IJF I would like to congratulate the Croatian Judo Federation for organising this event. I want to congratulate the media and sponsors and everyone who supported the Grand Prix. Good luck to everyone." Then before declaring the Zagreb Grand Prix 2017 open, the President of the Republic of Croatia, Mrs. Kolinda Grabar-Kitarovi, declared: "Dear sports enthusiasts, dear hosts and dear guests, it is my great pleasure to address you on the occasion of the opening of the Zagreb Grand Prix 2017. I am extremely proud that the Croatian Judo Federation has gained the confidence of the International Judo Federation to host this event and that the city of Zagreb has the opportunity to welcome the best judo players in the world and once again confirmed its reputation of an excellent host of great sports event. "Every sports competition in addition to bringing more fans to sports encourages a way of life and promotes healthy living habits. An active life makes us stronger and better, it prepares us to respond to life's challenges, whether we practice professionally or recreationally. "People who practice any type of sport are often more concentrated and more focused on reaching their goal and ultimately are more successful. "To all judo players and their coaches, to the world judo family, I wish you all a pleasant stay in Zagreb and I declare open the Zagreb Grand Prix 2017 in Croatia." 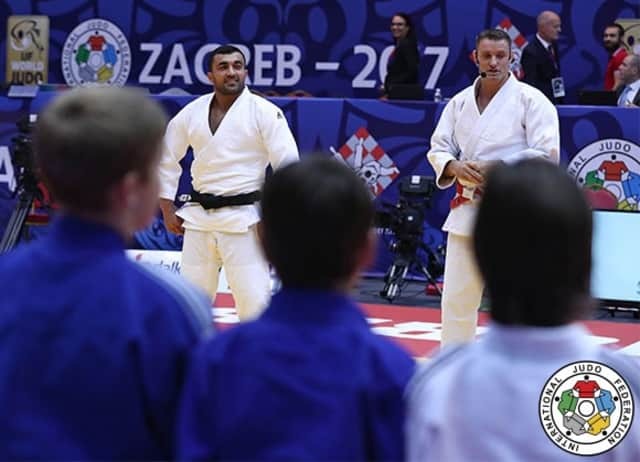 For the second day in a row, the young Croatian judoka were invited to join on the tatami with two judo heroes, Ilias Iliadis (GRE), former Olympic and world champion, and Mark Huizinga (NED), also a former Olympic champion. During more than one hour, they could enjoy the teaching of the great champions and try their best judo techniques against them. Ilias Iliadis said: "This is a really good idea, especially for countries where there are not that much judoka yet. I like it. I really do. It's nice to organise those activities on the competition tatami. I had so much fun so far and we still have one session tomorrow. I am impressed because all the children really want to fight and beyond anything they want to have fun which we had yesterday and today." Mark Huizinga, who is also actively involved with the IJF Academy explained: "Yesterday was was already great, but today we had a much bigger group, maybe three times bigger. All those children are so enthusiastic. During the day they can see the big players, and then they can step on the mat and do judo as well in the setting of a great competition with the cameras around. It's totally different from what they have in their judo clubs. "I enjoy a lot the IJF Academy as well. There, we teach the basics of judo in Level 1, then the basics of training in Level 2 and next year we will start the level 3 for professional coaches. When I started judo I had the chance to have a fantastic sensei (judo teacher), who taught me those important basics. Now that I can travel the world with the Academy and with activities such as today in Zagreb, I can measure what people want and what people need. I must say also that it's very rewarding because all the judokas I meet, they simply love judo and I'm happy if I can offer them what I know." There was a special guest today in the stands of the Zagreb Grand Prix as the President of the Hungarian Judo Federation, Mr. TOTH Laszlo was present, slightly more relaxed than a few weeks ago. It gave us a good opportunity to draw some conclusions after the successful organisation of the 2017 Suzuki Judo World Championships, which were held from August 28 to September 2. Mr. Toth started by explaining his feelings: "I am feeling very well. You have no idea how much positive feedback we received after the world championships. We received greetings from all over the world. Inputs before the competition are crucial, outputs after we completed the job are very important as well. From New Zealand to Swaziland we received congratulation letters. "For us this was the most important aspect: we wanted people to feel at home in Budapest. We wanted to have a united judo family and a nice celebration of the sport. We showed that our family is strong and successful. For me the opinion of the world is important but I can say that, in Hungary, from the people in the street to the highest personalities of the government, the image of judo is very positive. "Together with the IJF staff, we formed a very successful and united family. I want to address a special thank you to the IJF staff and to the IJF President, Mr. Marius Vizer. Our cooperation was brilliant." Then Mr. Toth admitted that he was a bit sad: "Yes, I was a bit sad when I had to pass on the flag to Azerbaijan for the next edition of the world championships in 2018. I didn't want to pass the flag actually (laugh). You know, after more than three weeks, every morning I still feel that I am during the Worlds, but I have to realise that this is over and I miss the pressure and that positive stress that made us work for the benefit of judo. "Yes, today I feel a little more relaxed, because we fulfilled our dream and it was a success. In order not to lose the momentum of the worlds, we are already working on next year's edition of the Budapest Grand Prix." The World Championships were not only a success from a sport perspective: "The social events were also very positive and well organised. The art exhibition for instance was a great success and in Hungary now is definitely among the top sports in terms of image. "It's incredible, since the beginning of September, all judo clubs are increasing their numbers. Judo has gained a lot in terms of image and is very respected. I must also say that having the visit of the IJF Honorary President and President of Russia, Mr. Vladimir Putin, was an unforgettable moment of the World Championships. Together with the President of Mongolia, HE Mr. BATTULGA Khaltmaa, many VIP's and at the end of the competition with the visit of Mr. Thomas Bach, President of the IOC, we definitely proved to the world that judo was at the top. "The team event was also a great success and we are happy that we could participate in that success for the very first time the mind team format was applied before the Tokyo Olympic Games in 2020." At the end, Mr. Toth Laszlo confessed a little disappointment: "I must say that as President of the Hungarian Judo Federation, it would have been great to win a medal. I think our team was very strong. 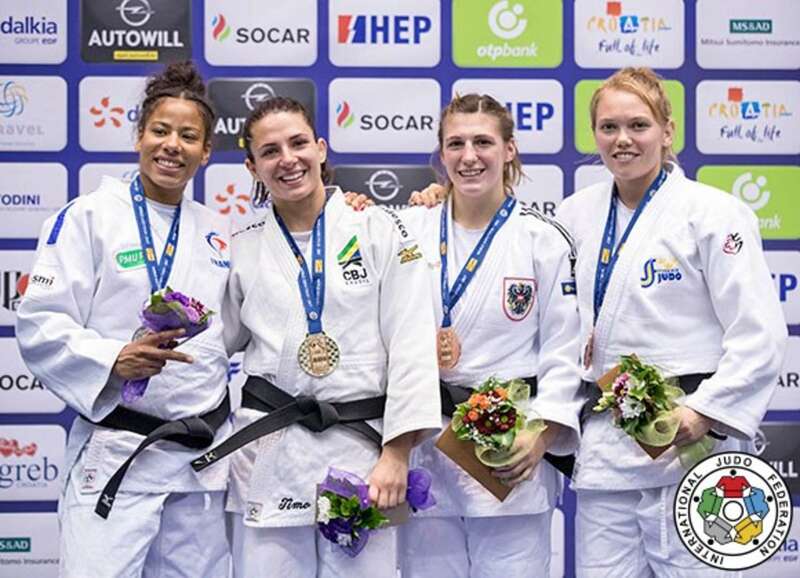 But I must also say that it shows how high the level of judo is now and also, because we wanted to welcome all the delegations in the best way possible, because we wanted to show how big our heart is in Hungary, we finally gave all the medals to our guests (laugh)." The final was 100% Japanese as TSUGANE Megumi and NABEKURA Nami both cleaned up their respective halves of the draw to guarantee two more medals for the Japanese delegation which already boasted three gold medals after the first day of competition. Despite a fierce battle to grab the judogi, after fifty seconds a first shido for passivity was given to TSUGANE. Before entering the last minute, TSUGANE was again penalised but this time for a false attack as she dropped on her knees in front of NABEKURA without putting her off balance. A few seconds later, NABEKURA scored the first waza-ari of the final followed a few seconds later by a second waza-ari with a drop seoi-nage, to win the fourth gold medal for Japan here in Zagreb and her personal third medal on a Grand Prix. The first bronze medal contest opposed Anriquelis BARRIOS (VEN) and Mia HERMANSSON (SWE). HERMANSSON entered the last minute with a waza-ari (o-uchi-gari) to her side but also two shido, putting her in a delicate situation as BARRIOS was pushing to score or force her opponent to be penalised for a third time. But HERMANSSON could finally control until the final gong to win a fifth medal in a Grand Prix. In the second bronze medal contest Lea REIMANN (GER) was opposed to Lucy RENSHALL (GBR). RENSHALL scored a first waza-ari with a superb koshi-waza technique on the edge of the competition area. 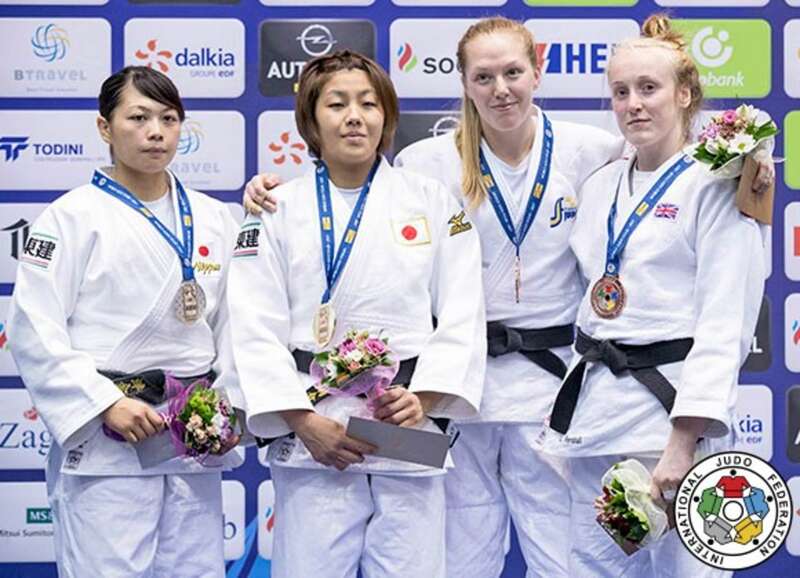 Despite one shido on each side, the score didn't change until the end of the bout and Lucy RENSHALL won the second Grand Prix medal of her career. 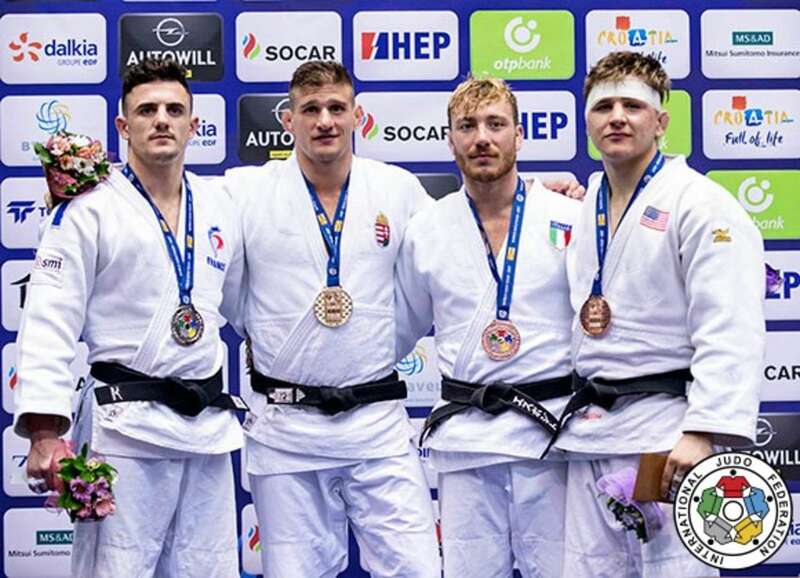 Without any surprise, the two top seeded athletes of the day met in the final of the -73kg category as Rustam ORUJOV (AZE) and Tommy MACIAS (SWE) went through the preliminary rounds without losing. The match looked pretty balanced during the first half, both athletes neutralising their opponent. 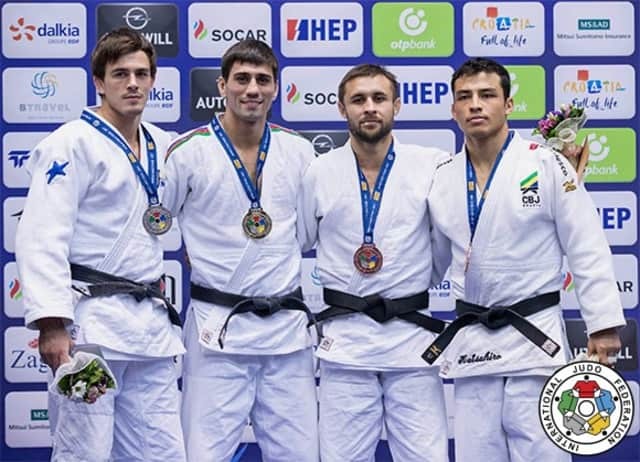 But ORUJOV had just to accelerate one time and execute a perfect left-handed ashi-uchi-mata for ippon, winning a fifth Grand Prix medal and the first gold medal for team Azerbaijan in Zagreb. It was a good opportunity also for the Olympic and world silver medallist to show his superiority and to taste again gold. Beside the two best athletes of the category, only two of the other favourites could enter the final block and wish for a spot on the podium. The first bronze medal contest opposed Uali KURZHEV (RUS) and Nikola GARDASEVIC (MNE). GARDASEVIC was penalised with a first shido for stepping outside of the competition area and only a few seconds later was thrown flat on his back by KURZHEV with a massive te-waza technique (arm technique) for a clear ippon. This is the fourth Grand Prix Medal for KURZHEV. In the second bronze medal contest Ahmed EL MEZIATI (MAR) faced Eduardo BARBOSA (BRA). The Moroccan was penalised with a shido after thirty seconds for blocking his opponent, and BARBOSA conscientiously imitated him a few seconds later to also be penalised. Again the Brazilian was penalised with a second shido. Knowing that he had a little advantage, EL MEZIATI seemed to take his time, playing with the potential third penalty against BARBOSA, but that was probably not a good strategy, as BARBOSA continued to attack and scored a waza-ari with a morote-seoi-nage combined with a tai-otoshi, immediately followed by an immobilisation for ippon. The home hero Barbara MATIC was defeated before the final and so Barbara TIMO (BRA) and Fanny Estelle POSVITE (FRA) met to decide the destination of the gold medal. A first shido was given to both athletes after a few seconds as they were grabbing one another fingers. Even if the French seemed stronger, the initiative of the match was in the hands of the Brazilian, who actually scored the first waza-ari with a drop seoi-nage. Incapable of any acceleration, POSVITE was under pressure and was penalised a second time for blocking her opponent. That is really the moment when doubt instils its poison, and POSVITE being incapable of any rhythm change had to concede the victory to Barbara TIMO who won the second gold medal for team Brazil in Zagreb. The first bronze medal contest opposed Emilie SOOK (DEN) and Michaela POLLERES (AUT). Both competitors were penalised with a first shido as they entered the second minute of the match. Again SOOK and POLLERES received a shido one minute later, 2-2. As Emilie SOOK stepped outside of the competition area, she was penalised a third time for hansoku-make and the victory went to Michaela POLLERES. The second bronze medal match saw Anna BERNHOLM (SWE) facing Barbara MATIC (CRO), who had the whole public behind her. Every action of MATIC was strongly supported by the crowd, which was close to exploding with joy twice as the young judoka was close to scoring. The first waza-ari came from the other side as BERNHOLM counterattacked the Croatian with a massive ura-nage. It was not the last desperate attacks of MATIC which changed the result, and despite all the support, MATIC lost while BERNHOLM could enjoy her fifth Grand Prix medal. With no surprise UNGVARI Attila entered the last final of the day. The surprise came from the second qualified athletes as it was the non-seeded Frenchman Jonathan ALLARDON who faced the Hungarian top seeded competitor. Both athletes engaged a very dynamic and mobile match, but half way to the end, there was still nothing written on the scoreboard. Nevertheless ALLARDON seemed to be a little fresher than the Hungarian, but after a confusing moment on the ground, UNGVARI suddenly engaged a shime-waza, which ALLARDON could not avoid and the Frenchman had to tap for ippon, offering the first gold medal at a Grand Prix for UNGVARI and the first gold medal for his delegation in Zagreb. The first bronze medal match opposed another Croatian athlete, Dominik DRUZETA (CRO) against Antonio ESPOSITO (ITA), giving a new opportunity to the host country to win a medal. After one minute and twenty seconds ESPOSITO was penalised with a first shido for blocking. Looking fresher than the Italian, the Croatian nevertheless lowered his rhythm and was penalised with a shido as well as both athletes were approaching the Golden score. Despite some good groundwork but some lack of ignition, DRUZETA was never able to conclude and two minutes of extra-time later he had finally to offer the victory to an exhausted but overjoyed ESPOSITO who scored a liberating waza-ari with o-soto-otoshi. The last bronze medal contest of the day saw Jack HATTON (USA) opposed to Joachim BOTTIEAU (BEL). The first shido was quickly awarded to HATTON for a defensive position. As nothing was scored during the remaining regular time, the Golden score sound echoed in the venue. The Belgian was penalised with a first shido during Golden Score, 1-1. 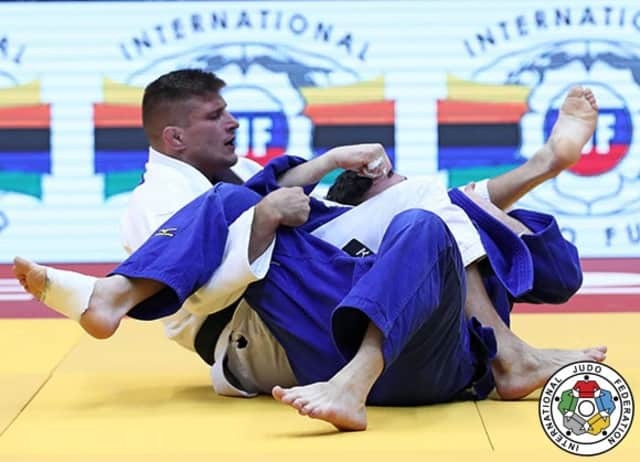 More than three minutes and thirty seconds were necessary for HATTON to score a waza-ari after a rolling seoi-nage during which the athlete almost crossed half of the tatami. BOTTIEAU seemed surprised but he was clearly scored upon and HATTON won his first Grand Prix medal.